Due to a number of reasons--including discrimination and a lack of transportation and child care options in Arab villages and towns, many Israeli Arab women with college degrees are un- or under-employed. 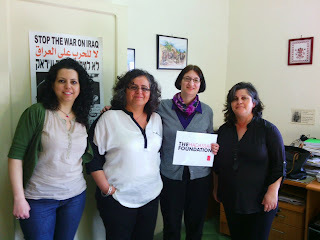 New Foundation grantee WAV (Women Against Violence) is a Nazareth-based group (their leaders are pictured above) that is working to maximize the potential of this population group. They work with college-educated women on their resumes and interview skills; simultaneously, they pressure the government to create programs and policies that will help this group. You can hear Aida Touma-Sliman, WAV,s Executive Director, discuss how the Hadassah Foundation is helping this effort here.